Earlier this year here in Financial Regulation Matters, we took a look at the confirmation of Steven Mnuchin as Treasury Secretary in the U.S. from within the concept of ‘Government Sachs’, which is a phrase that has been adopted to describe the continuous presence of former and prospective Goldman Sachs employees within the top offices of the United States political framework. The previous post focused on Mnuchin as he ascended to one of the most crucial jobs within the American political framework, but in this post the progression of Gary Cohn, who sits as the Director of the National Economic Council (NEC), will be the focus. Whilst the existence of ‘Government Sachs’ will not be questioned because, quite frankly, it cannot be questioned, assessing the effect that Cohn is having is an important endeavour because, as is generally accepted, these are currently quite extraordinary times. We saw in the last post on ‘Government Sachs’ that Goldman’s stranglehold on these societally-important positions is extensive and historic, with the connection dating back to Roosevelt (and likely much farther back). Yet, the formal departure of another Goldman alumni – Steve Bannon – has slightly reduced the perceived hold that the Company has upon the Trump Administration, so the question is what effect has that move had upon the Goldman/Trump dynamic? Well, in Gary Cohn, it is clear that the Goldman/Trump dynamic is going from strength to strength, with Donald Trump proudly declaring, in relation to Cohn, that he wants ‘people that made a fortune’ in charge of policy, not ‘poor people’. Whilst it is not even contentious anymore to state that Donald Trump has kept very few, if any of his campaign promises, the promise to ‘drain the swamp’ is probably the most obvious lie he presented to the American electorate. 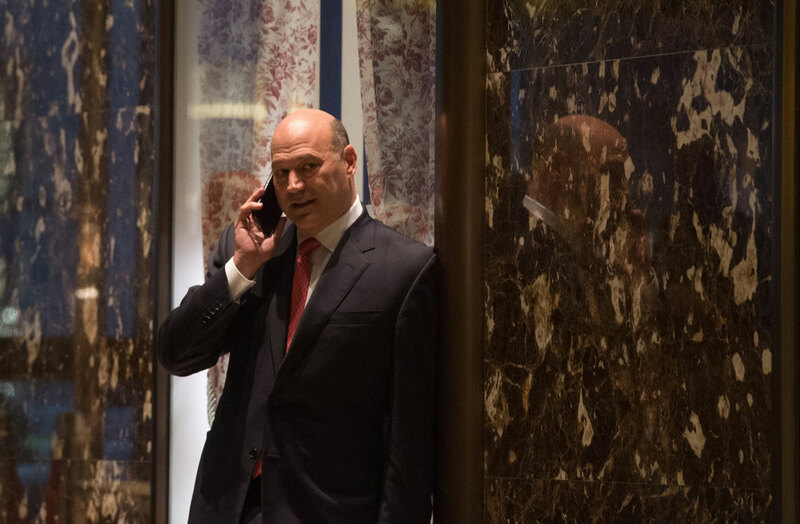 No one epitomises that ‘swamp’ more than Gary Cohn, and his record whilst at Goldman provides more than enough evidence to suggest that rather than him being heralded for taking a job that pays ‘peanuts’ ($180,000 a year of taxpayer money). If we consider Cohn progression and superimpose that onto a chart of the financial crisis and its creation, the synergy is clear to see. Starting in 1990, Cohn would navigate Goldman so that in 2002 he was name Head of the Fixed Income, Currency and Commodities division, which paved the way for Cohn to be named as co-Head of the global securities business in 2004 – as we know, just three years later Goldman would be at the centre of the system that brought the world to its knees on the back of its securities business; Cohn was paid more in 2007 than the Boss of Goldman, Lloyd Blankfein. If we look at Cohn’s relationship with Trump, we can see, bar two media articles, that Cohn is particularly important for Trump and his attempted policy revolutions (which are consistently being defeated). The first article which paints a differing picture comes from the ultra-right-wing and Steve Bannon mouthpiece Breitbart, which suggests that his place within the Trump Administration is crumbling. Whilst a publication like Breitbart is particularly distasteful, it worth mentioning that its attempts to ramp up pressure on Cohn comes from his denunciation of Trump’s remarkable and extremely unpleasant lack of support regarding the events in Charlottesville recently, which they are stating is the reason that Cohn is not being considered for the role of Chairman of the Federal Reserve. Yet, to look at Cohn in relation to the Fed is missing the point entirely, because his role in ‘Government Sachs’ can be achieved from his current position, one which did not need Congressional approval. If Cohn’s tax policies are to be adopted because, it is generally understood that Trump’s economic-related policies are in fact Cohn’s economic-related policies, then it is being suggested by onlookers that Goldman stands to save more than $1 billion a year in taxes alone. Additionally, another notable element of Trump’s apparent economic policies is to ease the restrictions and regulations surrounding the Initial Public Offering process which is, coincidentally, a Goldman specialty dating back over 100 years. Ultimately, we can be confident that whenever we hear Trump talk about economics, what we are hearing are Cohn’s words. Trump’s aiming for Dodd-Frank, when viewed within the Cohn-perspective, makes a lot of sense when we consider that Goldman will immediately and greatly profit from any deregulation. In reality, whilst Mnuchin was having his Congressional confirmation delayed over missing assets on his disclosure, Cohn was already in the White House and, if we remember, the crosshairs were targeted on Dodd-Frank almost immediately after Trump took office (in a more systemic way than the haphazard campaign promises anyway). It is being suggested by onlookers that whilst Mnuchin sits in the Treasury Offices blocks away from the White House, Cohn sits in the office a couple of doors away from the Oval Office, and this makes sense. There is a reason that Cohn was paid more than Blankfein in 2007 and that is because he is a consummate professional, or a ‘company man’ if you will, and can be trusted to enforce Goldman’s will in a manner which is required so soon after the Crisis. The progression of Cohn from the Senate hearings to the White House seems remarkable, but in reality it simply is not. ‘Government Sachs’ is real and is clearly evident, but with quite some time left in Trump’s term, the ‘end-game’ for Cohn needs to be considered. A pragmatic view would be that he is in that position to protect Goldman as the economic cycles career away from the Financial Crisis, but a cynical view is that Cohn is playing his part in readying society for the next onslaught, and the conclusion as to which one of those views is correct can be clearly found in monitoring the tearing apart of Dodd-Frank. If Dodd-Frank is deconstructed so soon after the Crisis, which in itself is a truly remarkable consideration, then we should know that the system is gearing up for another wave of extraction; in that sense, Cohn’s actions over the next few years are probably more important than Donald Trump which, although may seem surprising considering the day-by-day degeneration of political standards in the U.S., signifies the importance of financial regulation in this modern society.